Forget digital crowns and rotating bezels; researchers at Carnegie Mellon University are positing that the future of smartwatch control is on your skin. The so-called SkinTrack involves a ring that emits a high-frequency signal and a wristband packed with electrodes. As the ring’s signal propagates through the body, SkinTrack measures the phase difference between electrodes on either end of the band to figure out the location of fingers on the skin. This in turn transforms the wearer’s wrist into a 2D trackpad for a smartwatch screen. In a demo on YouTube, the wearer is able to scroll through music tracks, tap on their hand’s invisible phone dialer, draw letters, and even play a game of Angry Birds. 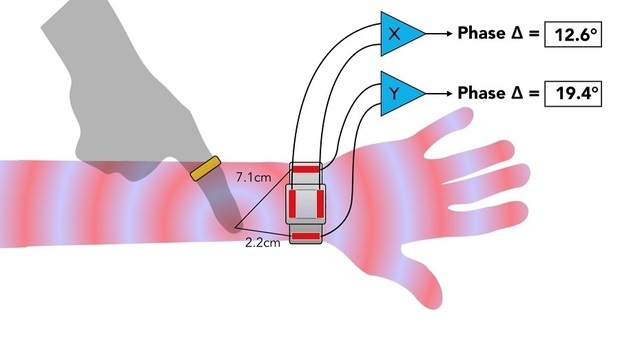 The researchers note that the system works with clothing over the wrist, and can even pick up movements just above the skin. There’s just one problem: The current prototype is pretty bulky, requiring hefty electronics on the ring and a wide wristband that has its own circuit board. But the researchers don’t see this as a long-term problem: “As our approach is compact, non-invasive, low-cost, and low-powered, we envision the technology being integrated into future smartwatches, supporting rich touch interactions beyond the confines of the small touchscreen,” they wrote on YouTube. Why this matters: SkinTrack is not alone in its attempt to improve input on small wearable displays. Aside from the Apple Watch’s Digital Crown and the Samsung Gear S2’s twistable bezel, one startup is working on a wristband that senses finger movements, while Microsoft has patented smart rings that detect air gestures. Google’s own Android Wear watches detect wrist gestures already, and the company has also shown off touch-sensitive garments and finger gestures detected by radar. Sooner or later, someone’s going to get it right in a way that can be commercialized.